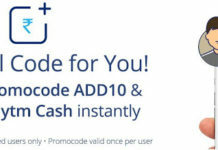 Give your details and enter ” jwcquq ” in PROMO/REFFERAL CODE option. Now enter other details and create your account successfully. Mobile verification is done automatically. Now share to your friends and family and you will get 50 Rs in your Pockets account when your 3 friends download the app & Sign up by your referral code. On referring 3 friends, you get Rs. 50 in your Pockets wallet within 7 days from the date your 3rd friend has created the wallet using your referral code.